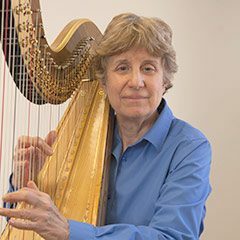 JoAnn Turovsky is principal harpist with the Los Angeles Opera Orchestra, the Los Angeles Chamber Orchestra, and the Los Angeles Master Chorale and Sinfonia Orchestra and is the recipient of a lifetime achievement award from the American Harp Society. Turovsky has been the professor of harp at the USC Thornton School of Music for the past thirty-some years and is also on the faculty of the Colburn Conservatory of Music and the Colburn School of Performing Arts. In addition to a lifetime achievement honor from the American Harp Society, Turovsky’s numerous awards and citations include first prize in the American Harp Society National Competition, Young Professional Division, the first prize in the Coleman Competition for Chamber Music, prizewinner at the Fifth International Harp Competition in Jerusalem, Israel, an award from the Young Musicians Foundation, and the Schoenfeld Artist/ Teacher award in harp from the California Chapter of the American String Teacher’s Association. She is chairman of the American Harp Society National Competition. Turovsky is also a “first call” musician for a plethora of film and television assignments. The composer John Williams wrote a solo piece for Turovsky that was featured on the soundtrack of the film Angela’s Ashes, while her performances also grace such films as Avatar, Raiders of the Lost Ark, The Karate Kid, Toy Story (plus its sequels), The Kite Runner, and Thirteen Conversations About One Thing, among the more than 400 movie soundtracks in which she has participated. Most tellingly, it is Turovsky’s playing that sends chills up the spine in a variety of horror movies, among them War of the Worlds, and video game classics, including Resident Evil 5.